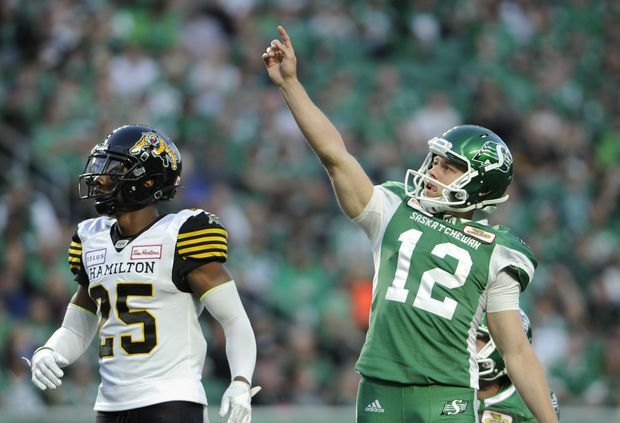 Saskatchewan Roughriders kicker Brett Lauther hits a 52-yard field goal against the Hamilton Tiger-Cats during a game at Mosaic Stadium in Regina on July 5, 2018. The Saskatchewan Roughriders added a free agent, kept one of their own and signed Canadian kicker Brett Lauther to a one-year extension through 2020 on Friday. Lauther, of Truro, N.S., was named a West Division all-star last year after hitting 54-of-60 field-goal attempts. The 90-per-cent success rate was the second-best mark in club history. Lauther, 28, was named the Riders’ outstanding special-teams player and top Canadian last year. He broke into the league with the Hamilton Tiger-Cats in 2013, but didn’t get another shot in the regular season until last year. Saskatchewan also re-signed receiver Naaman Roosevelt and added fellow American Emmanuel Arceneaux. Both players signed one-year deals. Roosevelt is entering his fifth season with the Riders. In 2018, the 31-year-old Buffalo, N.Y., native had 48 catches for 570 yards and four touchdowns in 14 regular-season games, He added seven receptions for 79 yards in the West semi-final. Roosevelt has recorded 224 catches for 3,188 yards and 19 TDs over his CFL career. Last year, the 31-year-old had 32 catches for 553 yards and one touchdown in nine regular-season games. Arceneaux was named a CFL all-star in 2015 and 2016, and a West Division all-star in 2015, 2016 and 2017. Former Carleton University star receiver Nate Behar is returning to Ottawa after signing a one-year deal with the Redblacks. Behar had 27 receptions for 257 yards and a touchdown last year for the Edmonton Eskimos, who drafted him fifth overall in 2017. The Redblacks also re-signed American receiver Dominque Rhymes to a one-year deal. The 25-year-old Miami native has spent the past two seasons in Ottawa. Last season, Ryhmes caught 22 passes for 303 yards and a touchdown. He has 522 receiving yards in 19 career games in the CFL for Ottawa. American defensive back Gump Hayes has rejoined the Calgary Stampeders. Hayes originally signed with Calgary on May 9, 2018 but spent the entire season on the practice roster. The B.C. Lions have re-signed American defensive back Garry Peters to a one-year deal. The 6-foot, 190-pound Peters had 73 tackles, two interceptions, one sack and a forced fumble in 18 regular-season games last season. The Winnipeg Blue Bombers have signed offensive lineman Kendall Calhoun and defensive back Malik Reaves. Both players are Americans. The 6-foot-7, 300-pound Calhoun spent time in the NFL with the Houston Texans and Washington Redskins. Reaves, a 6-foot, 200-pound defensive back, signed as an undrafted free agent last year with the Kansas City Chiefs and was also with the Pittsburgh Steelers.